Fall Fishing Tips – Get Aggressive! This week’s Fly Fishing Tip is courtesy of RiverBum.com and Jake Ricks of Utah Fly Guides. I’ll never forget the time I watched a guy on Utah’s Green River just killing it with a huge streamer. The thing was 6 or 8 inches long and tied to imitate a trout. He was catching fish that usually turn their noses up at anything larger than a size 18. Aggressive fish will hit intruding fish, sometimes to eat them, but also trying to kill them to get them out of their territory. 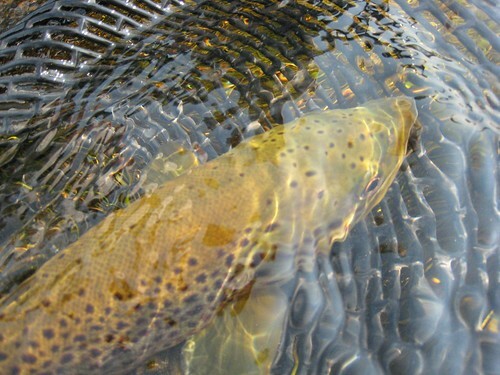 In the right situations, big saltwater streamers like Clouser Minnows, Half & Halfs, Gummy Minnows, and Deceivers can produce amazingly well for trout, especially browns, big brookies, tigers, and others that are particularly territorial. One Alaskan salmon fishing trip will have you convinced that bright colors work. Experiment with bright colors for fish in your area and for different seasons. I really like orange and yellow streamers in the fall like Orange Blossom Specials, Halloween Buggers, Zoo Cougars, and the ever-awesome screaming Yellow Zonker. Get your streamer right in front of fish and then strip fast and move it erratically. Here’s your chance to be annoying and have it pay off. This is easiest to do when you can actually see fish in shallow water. Seems a little weird to dead drift a big streamer but I’ve landed plenty of fish that were willing to attack a what appeared to be a lifeless minnow drifting in the current. These strikes are quick, sometimes looking like warning shots, so this works best when you can see fish and anticipate the timing of the strike. It also works in fast enough water where fish have to strike fast. These fish will hit hard enough to actually help you to hook them. It’s quite enjoyable being the antagonist for a change. Now get out there and make some fish angry.